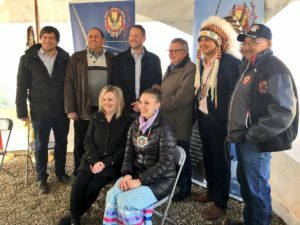 Cowessess First Nation, located 140 kilometres east of Regina commissioned their latest renewable energy project in October 2018. Ready to show the immense power of two forms of renewable energy combined, solar and wind, the community has established an innovative project that has the potential to empower future generations. Chief Cadmus Delorme describes their solar and wind project as living proof that First Nations in Canada are willing and ready to play a significant role in the transition towards clean energy. October 2018 marked the launch of the Cowessess Renewable Energy Storage Facility, which promises to generate 400 kilowatts of sustainable energy through the use of wind and solar energy. The community first began their transition to the renewable energy in 2012 with a wind turbine project that utilized battery storage as a “means to collect and store wind energy”. In the following years, the community created a hybrid form by combining the power of wind and solar energy for a more stable supply of electricity. The project, which added solar panels to the existing wind turbine, has been coined as “possibly the first wind-solar battery storage project in Canada”. The project will provide valuable data on how best to implement this type of system in other communities. Funding for the solar panels came from revenue from the existing wind turbines at the site, debt financing from the First Nations Bank of Canada, and funding from Western Economic Diversification Canada and Indigenous Services Canada. Adding even more value, the project offers a way for the community to develop new businesses and jobs in the energy development sector. The project also employed Cowessess citizens during the construction of the project. Two citizens have since been hired full time by the contractor, Skyfire Energy. Upon the launch of the Cowessess’ project, a field trip by the school is said to have given the class hope and inspiration for renewable energy projects: “This is Canada’s solar generation — young, wide-eyed and ready to make a difference”.